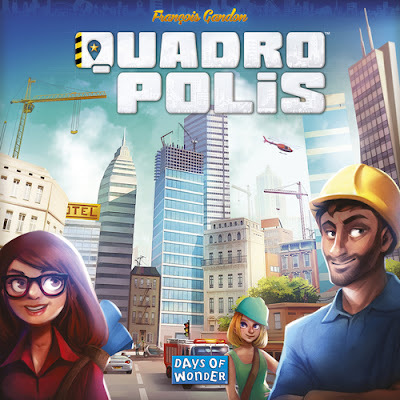 New and just in from Days Of Wonder is Quadropolis a great family city-building game for 2 to 4 players that plays in under an hour. You are mayors of your own growing city and are competing to develop the most winning city. Over the course of four rounds you will send your architects to the main construction site for buildings to put in your developing city that include parks, shops, tower blocks, harbors, factories, and public services. Each building type has it's own scoring method. As soon as your architect takes a building from the construction site board you will place the Urbanist pawn on that spot thereby blocking that row and column of building tiles from the option available to the next player. Which buildings and how they're placed in your city will affect your end of game scoring. Some buildings when placed in your city will give you inhabitants and/or energy units which are necessary for activating your various buildings. Buildings will need to be activated in order to score them. 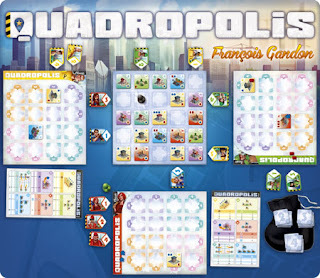 Quadropolis is a colorful game that includes two game modes - Classic and Expert, as well as a mini Playgrounds expansion. The player boards and architect tiles are double-sided to accommodate the Classic and Expert play modes.